A controversial new claim made by archaeologists states that the Easter Island moai statues could have walked out of the quarries in which they were made. The archaeologists demonstrated this feat with a 4.4-tonne model. The scientists published their findings in the Journal of Archaeological Science. 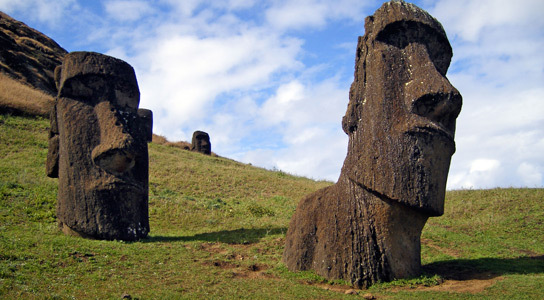 There are nearly 1,000 statues littering Easter Island’s 163 square kilometers, with the largest weighing 74 tonnes and standing 10 meters in height. One of the most perplexing facts is how these statues were transported kilometers from the rock quarries where they were carved. It was thought that the Polynesians, who settled Easter Island 800 years ago, had used logs to roll the moai into place, which supports the idea that the Rapa Nui people became so obsessed with statue-building that the deforested much of the island’s forest. Carl Lipo, an archaeologist at California State University, Long Beach, proposes instead that the Rapa Nui walked the moai by rocking them side to side to their final resting places. The incomplete statues that had yet to reach their pedestals lean noticeably forward, a posture that doesn’t lend itself to horizontal transport. Broken moai along the roads that were most likely abandoned also suggests vertical transport. With the help of a ship-building company, the researchers constructed a 3-meter model of a moai. It took a few attempts for the archaeologists to eventually make the model walk. It managed to travel 100 meters in under an hour, and this attempt needed 18 people. However, not everyone is convinced by this experiment. The shape of the model used isn’t an accurate facsimile of the moai, so the conclusions drawn from this could be irrelevant. Yet some aspects of the statues’ design seem to imply that they were intended to be transported vertically. Their center of mass is centered vertically and horizontally, but sits slightly forward of center on the front-to-back axis, making them easy to rock from side to side. 1 Comment on "Easter Island Moai Statues Could Have “Walked” Out of Quarries"
THIS is WHY.. Easter Island + its statues, the ENTIRE island is a giant 3d ideogram…A ring of volcanic statues some dormant some with red erupting tops,,,, sitting within the Pacific Ring of Fire…a ring of volcanoes…some dormant some with red erupting tops…they spoke “pictionary” they created Easter to teach us they knew volcanology….with that key one could then solve the others…Giza pyramid is also a 3d ideogram…add back the mirrors missing from the super pyramid + you have VOLCANIC MIRROR the science of super volcanoes + volcanic solar reflectivity “aerosols” cools earth + saves from solar flare…They sent visual message because they knew not what language the future would speak but we would all SEE the same…ANY languages, lands, nationalities can SEE the messages…google easter island ring of fire…or see my fb pages or youtube vids….PROOF? you can SEE them.